Planning on renting a car in Queenstown? VroomVroomVroom's booking system will let you search for car rentals from top suppliers such as Avis, Budget, Hertz and Thrifty. Avoid wasting time and effort by going through multiple websites since you can easily compare the top car hire deals in our website. 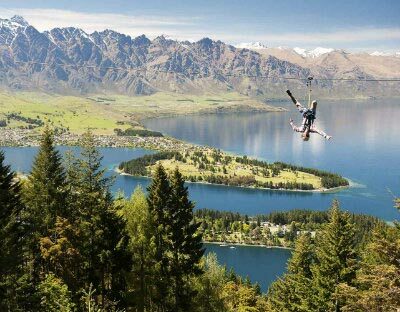 Queenstown is New Zealand's adventure capital. The home of bungee jumping is also an exciting winter destination offering a wide range of alpine activities. The beautiful landscape of Queenstown had a starring role in the "Lord of the Rings" films, and fans have the option to join guided tours to explore the filming locations. Why rent a car in Queenstown with VroomVroomVroom? Wide selection of vehicles - We provide you more choices when you book a vehicle with us. Aside from having more choices in rental cars, you can also compare and book a campervan hire in Queenstown . Visit our campervan page for more information. Great rates - We have negotiated with our partners so we can provide the best price. Read our Price Promise to find out how you can get the best deal. Excellent customer service - We have been helping people book a hire car since 2001. We provide great customer support through our highly-skilled customer care experts waiting to answer all your car rental questions. Summer is an ideal time to visit Queenstown. From December to February the sunnier weather allows for more outdoor activities. The town is home to some of New Zealand's premier golf courses such as The Hills and Millbrook. Check out some more fantastic experiences from Queenstown here. Many people decide to visit Queenstown during the winter to participate in snow sports. Visitors arriving in June may be lucky enough to catch the Queenstown Winter Festival, offering days of activities, displays and performances to celebrate the beginning of winter. Last winter, Queenstown Airport completed a 1.65 million dollar lighting project, involving 200 LED lights, as part of their runway upgrade to allow evening flights. The highways surrounding Queenstown can be challenging, with tight bends and corners. From April to October ice and snow can affect the roads. In the Queenstown area gravel roads are common, and visitors should take care when driving. The Crown Range Road to Wanaka can be challenging in icy conditions, particularly for larger vehicles. Note that there are no toll roads in the South Island. Although the highways are in good condition, some roads can be challenging. If you are driving from Queenstown to Milford Sound, consider breaking up your journey in Te Anau. The full journey to Milford Sound will take more than four hours. Most car rental companies do not allow their vehicles onto Skippers Road, or on the road to Macetown. You are also not permitted to take the vehicle on any unsealed roads. ​For more driving tips, click here​. Come and experience Hot Air Ballooning with Sunrise Balloons. 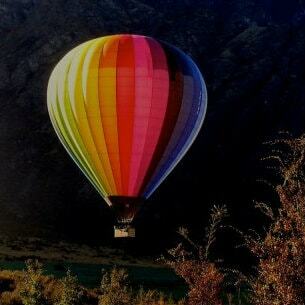 Hot Air Balloon rides and flights with Sunrise Balloons take place in the valleys of Queenstown. As you rise to altitudes as high as 6000ft and drift with the breeze, you will witness quite possibly the best panoramic views of Queenstown and its surrounds - “The Hobbit” filming locations, Southern Alps, Lake Wakatipu, The Remarkables mountain range, NZ's finest golf courses and many more. And it's even better during a hot air balloon ride followed by a champagne celebration. Sunrise Balloons is a family-owned and operated company which has been flying in the region since 1998. Transport is offered to and from accommodation in Fernhill, Queenstown and Frankton Road. But if your Hotel is outside this area they will arrange a convenient meeting point for you. Launch site is only a 15 minute drive from downtown Queenstown. Passengers need to phone Sunrise Balloons 45 minutes before pick up time to know if flight is operating (weather permitting). Glenorchy Air is a New Zealand scenic flight airline based in Queenstown. Board one of their small planes and be amazed as you experience some of the most spectacular scenic flights in the world. Glenorchy Air is a family owned business that has been operating since 1992 with a perfect safety record. Their scenic flights include trips to Milford Sound, Mount Cook National Park and their local glacier flight, which circles Mount Aspiring before returning along the Dart River. They also offer the experience to charter your own plane and explore the South Island freely. Their family business is one of a select few that have the privilege and experience to truly unlock the stunning landscape and scenery of New Zealand. 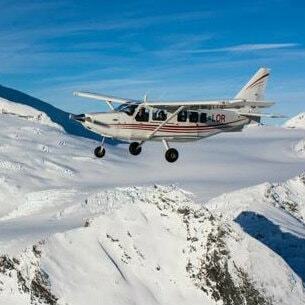 Enjoy and explore unimpaired views of the snow-capped Southern Alps, magnificent fiords, crystal lakes and vast glaciers with their friendly and knowledgeable pilots. Also, they guarantee a window seat for all passengers and fly their own unique route to add extra fly time and offer all of their customers the best scenic experience possible. If you are looking for a memory that will stay with you forever, Glenorchy Air has all the experience, knowledge and the passion to give you that. Get the best view of the Southern Alps and Fiordland by joining the sightseeing excursions of Air Milford. The family-owned aviation company is known for their well-maintained aircraft. In fact, they have one of the highest safety audit ratings in New Zealand. They boast of their fleet of high-wing aircraft including the Turboprop Cessna Caravan, which is the biggest and quietest scenic aircraft in Queenstown. Enjoy the sight and sounds of New Zealand's wildlife and bush in their 5-acre breeding sanctuary. Started over 30 years ago by a local family, they have planted over 12000 native trees. They are that oasis in the hustle and bustle that is Queenstown. Come in and see real kiwi and over twenty other native birds and reptile, including the tuatara. Experience conservation in action and learn about our breed and release programs. Entry includes an all-day pass, access to kiwi feedings, New Zealand's original and best Free-flight Bird Show and an audio guide to self-guide the Park. Spend time browsing for that perfect gift in our shop or relax with a coffee or light meal in our scenic Kiwi Café. Price: Adult NZ$48, Child NZ$23, Family NZ$110 (Prices valid until September 2018). The best way to beat the cold weather is by soaking in a hot pool. Imagine feeling the warm water all over your body as you stare over a beautiful scenery – now that is total relaxation. 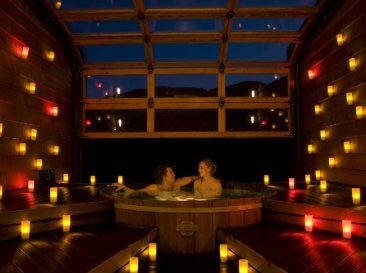 You can experience that at Onsen Hot Pools, which is the only private indoor and outdoor hot pools in Queenstown. It is located on top of the cliffs thus giving breathtaking views of the Shotover River canyon. You are assured of complete privacy, tranquil surroundings, and amazing scenery during your stay. This is the perfect place to bond and relax with your lover, friends, and family. Thrill-seekers should definitely try Ziptrek Ecoutour's fun zipline tour, which is situated on the spectacular Skyline Gondola hill. Experience exciting eco-adventure above Queenstown anytime of the year as they operate zipline tours rain or shine. Ziptrek offers two tours so make sure to choose the one that best suit your skills. The Moa 4-Line Tour is best for beginners while the Kea 6-Line Tour is for those who are looking for an eco-exhilarating zipline experience. Central Otago has become one of the world's premier cool climate wine regions attracting major international praise. Departing from Queenstown and specialising in small group or private, personalised tours, taking you to two of Central Otago's wine regions through stunning alpine scenery. With a wealth of local history and wine knowledge, your expert guides will ensure you enjoy every aspect of the day. The founding vineyard of Central Otago is still one of New Zealand's premier winery experiences. Knowledgeable front-of-house staff dispense tasting portions and take tours through the unique wine cave, there's a great restaurant and cheesery on site. Many wines are only available from the cellar door. 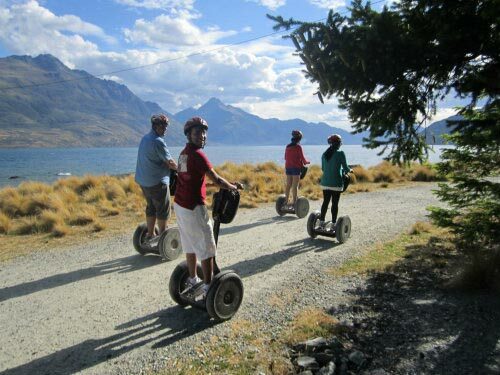 Apart from road trips, another fun way of exploring Queenstown is with a Segway Personal Transporter (PT). Don't worry if you're a newbie, because Segway on Q can give you quick training on how to use your segway before you begin your adventure. They also have a very accommodating guide who will show you around and share some information about the town. Enjoy breathtaking views of the lake and the gardens on your Segway. The Queenstown tour usually takes two hours while The Bay tour only lasts for an hour. Take a scenic cruise on stunning Lake Wakatipu from the centre of Queenstown. Fill up with 90 minutes of scenery on the historic, 100-year old Earnslaw. The trip can be combined with a visit to the Walter Peak High Country Farm for a tour, a horse-trek or bbq lunch. Instead of staying in a hotel, why not feel more at home by staying in a luxury condominium? The Ridge View brings the comfort of a real home and the luxury of a hotel. The accommodation features four spacious bedrooms located over three levels, a fully-fitted kitchen, cosy living area, and a beautiful courtyard. 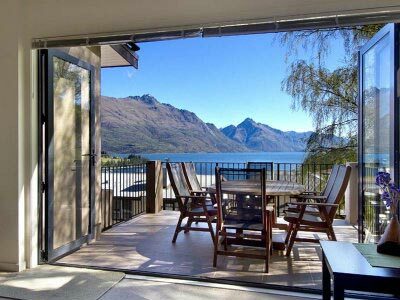 Enjoy picturesque views of the Cecil Peak, Remarkables, and Lake Wakatipu in your own balcony. The Ridge View also boasts of its superb location near the town centre where you can find a wide selection of restaurants and bars. 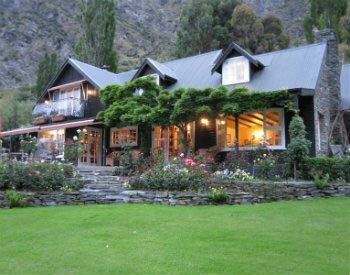 By staying in one of the most popular Bed and Breakfast accommodations in Queenstown, you are assured of a perfect holiday. Trelawn Place is known for its homey atmosphere, warm hospitality, and stunning views. It is conveniently located near the city centre and just 15 minutes away from the Queenstown Airport by car rental. Hosts Nery and Michael have worked hard to make sure that they give the best accommodation to their guests. They are pet lovers too so you can bring along your furry friend during the holidays. Lakeview Holiday Park is the most centrally located holiday park in Queenstown, just a 500m walk from the town centre and lakefront. This park has been awarded a 4-stars-plus Qualmark rating, a Travelbug 100% Guest Experience award, and it was voted among the Top 5 Holiday Parks in New Zealand by Wotif reviewers. Offering accommodations of 1 and 2 bedroom units, flats, studios and campsites, powered or un-powered, it is ideal to park your campervan and enjoy your stay surrounding by scenic views. 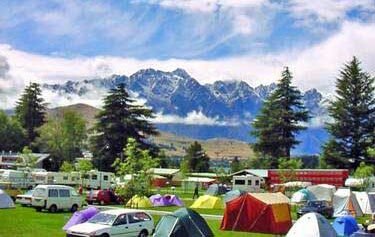 There are also camping facilities and many optional activities to experience in Queenstown. 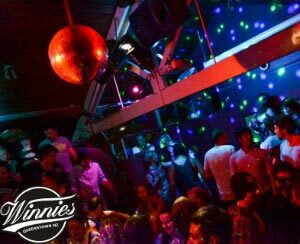 Winnies is more than just your typical pizza restaurant. Apart from their gourmet pizza, they also offer other scrumptious menu ranging from steaks to salads. This is the perfect place to being your friends and family because of their relaxed environment and great food selection. They even have gluten-free and vegetarian dishes as well as a special menu for children. You can also have a drink, and watch live music performances at the bar. 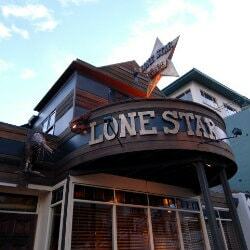 Get a real cowboy experience by visiting Lone Star, which is known for their western art and country music. The restaurant's theme has attracted many New Zealanders and there are currently 26 branches all throughout the country. They have been offering a combination of Kiwi classics and comfort food as well as Lone Star specials for more than 21 years. Some of their best-sellers include Redneck Ribs, Lassoo of Hog, and Dixie Chicken. 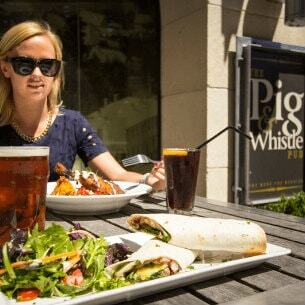 There are many reasons why people love going to The Pig & Whistle Pub, including their unique Old English pub ambiance and excellent service. Its location right in the centre of the town makes it very accessible to both locals and tourists. If you're a beer lover, then you will definitely enjoy their selection of beers. There are more than 17 tap beers to choose from and these can be paired with their affordable pub meals. You have the option to dine on their sunny deck overlooking the Horne Creek. If you're a huge fan of Monteith's boutique beers, then Monty's Bar and Restaurant will be paradise for you. The owner of the concept bar, Barry Ellis, has established a place which serves a wide range of award-winning tap beers from Monteith's. Whether you are in the mood for an original ale or a golden lager beer, you can enjoy that alone or matched with their superb menu. Make sure to try their signature dish called the Chicken Filo Parcel or their flavourful Lamb Shanks. There are lots of fun things to do in this beautiful town. If you're driving to Queestown on a rental vehicle, you may want to check out these yearly events. Jazz Fest Labour Weekend Happening every Late October. From cool blues and big band swing to funk R&B and Latin beats, this Jazzfest offers local, national and international acts that showcase their talents across the genres of jazz. This three-day musical feast occurs every Labour Weekend and there's bound to be something to get your shoes tapping. Queenstown International Marathon on 19 November. One of the most scenic marathon courses in the world! Distances to suit a range of abilities. Queenstown International on 20-24 November. This inaugural teams golf tournament will feature two rounds at famous Millbrook, and one at Jack's Point. New Years Eve in Queenstown. One of the best places to be! Live music, party atmosphere, and free fireworks. Winter Festival Happening Early July. It may be over for this year, but start planning for next year's event! Renowned as the Southern Hemisphere's biggest winter party, this 10-day festival celebrates it's community and culture with fireworks, street parties, Mardi Gras, international and local jazz and comedy acts, parades and heaps more on the ski slopes. Magnet to more than 45,000 people from around the world -- book your hire car early, you won't want to miss out! Have you been to Queenstown? What are your favourite spots? Please share your comments and experiences below. Feedback: So far all good. Let’s see what happens when I actually pick up the car. Feedback: Didn’t work the first time and had to resubmit the form, but then it was fine. Feedback: Repeat client, its a great service thanks! Avis Queenstown City - 68-70 Stanley Street, Queenstown, SI. Budget Queenstown - 68-70 Stanley St, Queenstown, SI. Hertz Queenstown Downtown - 1-7 Ears St,st Peters Close, Queenstown, SI. Thrifty Queenstown City - 1 Shotover St, Queenstown, SI.